In 2004 an 8 year old girl named Precious was undergoing treatment at UC Davis for an illness believed to be a severe flu. In fact the child had contracted rabies, via a bite from a feral cat, at her school, several weeks earlier. The miraculous part of the story, is the child survived. In essence defying 2000 years of recorded medicine. It is generally the rule that once the rabies virus has attacked the brain, it is nearly 100% fatal. It’s an exceptional story, and unfortunately the exception to the rule. Rabies is believed to be the oldest known zoonotic disease. It is recorded since medical records have been kept, and is believed to be depicted in cave drawings of early man. So it’s safe to say that rabies will not be irradiated in any of our lifetimes. Given that I thought I’d cover how to best protect yourself, pets, and family. First, what is a vector animal (an animal who can potentially transmit rabies). Truthfully, any mammal may contract rabies. Topping the list of rabies vector animals are: bats, raccoons, fox and skunks. rodents have virtually non existent cases of rabies. Opossums rank very low for contracting the virus, as do rabbits. Birds, reptiles, and amphibians are not vector animals for rabies. To protect yourself its best to have a general idea of the disease process. rabies enters an opening in the skin, via a bite or scratch in most cases. once the virus enters it enters a nerve ending and begins to travel to its inevitable target, the brain. Once there the virus is shed through the salivary glands to another potential host. There have also been reported cases transmitted by saliva of an infected animal entering the eye of a new host. Important things to remember to be safe, if bitten or scratched by any wild animal or domestic animal with an unknown vaccination history: allow the wound to bleed and clean thoroughly with running water, allowing any saliva to be flushed from the wound. Contact your doctor, or hospital and, if recommended, begin post exposure prophylaxis. The sooner you receive treatment the better. 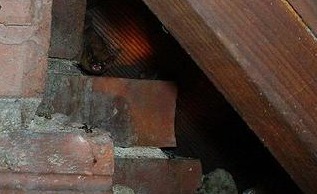 Another important note, if you wake up with a bat in you room, you may have been exposed. Bat’s teeth are quite fine, much like hypodermic needles. It is possible to be bitten while sleeping and not find a wound or feel any pain.